Super Bowl halftime shows have had a pretty wide range over the years; starting out with mostly college marching bands and currently sometimes ending up in huge controversy (like the above or M.I.A. last year). For the past twenty years or so, though, the halftime show has settled into two categories for the most part: aging rock star or in-the-moment pop sensations. There just hasn’t been a lot of imagination. I truly believe, and so do Todd and Wes deep down even though they won’t admit it, the combination of Aerosmith, N’Sync, and Nelly was pretty electric, and a legitimate combination of current and aging talents. Alas, they didn’t make the list. Neither did The Who (decrepit), Madonna (mummified), or the Shania Twain, No Doubt, Sting combination (puzzling). In fact, this list is not nearly as strong as we would have expected, so I ripped to some degree on several acts. Enjoy, and as always let us know what you think in the comments. After the 2004 Janet Jackson debacle (blessing? ), the NFL decided to trot out a lot of very “safe” acts for some time. Hence, a bunch of old bags of bones (stones?) took the stage in 2006 and sounded much smaller than the event demands. 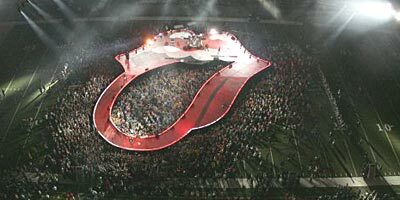 As a consolation, the stage is phenomenal, and Keith Richards puppet-master continues to get paid for his superb work.